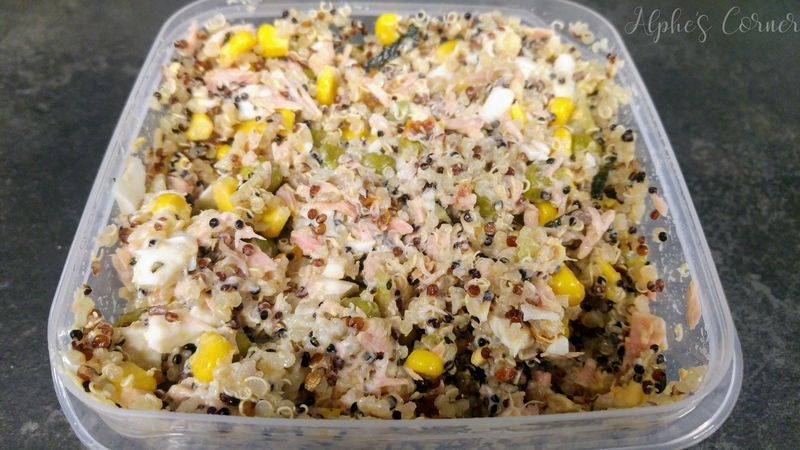 This salad is a great source of lean protein (from tuna, egg, yoghurt, quinoa and peas), complex carbs (quinoa), and healthy oils (tuna). You can pretty much say that it’s packed with good nutrients to the maximum! Cook quinoa following the instructions on the package, drain it, let it cool. Cut the egg into small chunks. Drain the tuna and crumble it into smaller shreds. I recommend using tuna canned in plain water, not oil or some other sauce. Combine all ingredients in your lunchbox. Season the salad to taste with salt, pepper and herbs. Looking for other office food inspirations? I would agree. Today’s salads are not boring as they once were. They can be healthy and delicious! If you use flaked tuna, it will save you time from crumbling the tuna further as well as saving prep time. That’s true! I’m no expert in tuna production, but all of the canned tuna I’ve used so far was actually already kind of in chunks or flakes – if you simply put a fork inside and move it around, the fish instantly falls apart. This looks great. It’s always nice to try a new salad and have something healthy for lunch – I’ll definitely have to try this! That sounds really great! I do like a Quinoa salad! I like this salad! Or, at least, I _think_ I like it, because I’ve never eaten quinoa! 🙂 However, I’ve eaten salads made with tuna and sweet corn, and I like them very much. But recently I’ve read something about corn and mycotoxins and I haven’t eaten corn anymore, thinking it could be dangerous, but I still have to look into this matter better. Resolutions? They are going quite well, even though I’m a bit behind schedule! Forget the schedule, what matters is that we try!